This past week has been a hustle and bustle of activity and I have hardly had a chance to blog. So I am trying to catch up on my reviews the over the next few days. If you receive my posts by email, then you may get more than one review per email, and the order they show up in may be a little out of sync. My apologies. How are your Christmas preparations going? I am almost finished up with mine, Thankfully!! I am so excited for that. Most years, I feel like I am shopping on Christmas Eve. I still do have a few gifts I want to make, so am hoping to get those finished this coming week. The kids an I have really been enjoying our Advent reading of Ishtar's Odyssey. I love that they are practically begging me to read it every evening. 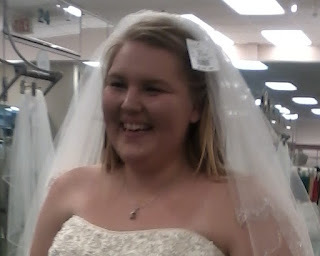 I went wedding dress shopping with my daughter this week too. It was so much fun!! The Aha! moment when she knew that was the dress, and couldn't stop smiling was exciting. The look on her face - priceless!! Ironically, it was the first dress she tried on. After that we tried a few other ones, just to be sure, but none of them lit her face like the first. I am a mixture of emotions. But deep down, I have a peace that this is God's plan for her, and I am so happy for her. Well, friends, that is how my week has been going. So hopefully, you will bear with me the next few days as I bombard the blog with reviews. Have a blessed weekend!! Take time to focus on the Reason for the season. Your daughter is beautiful! Merry Christmas! !